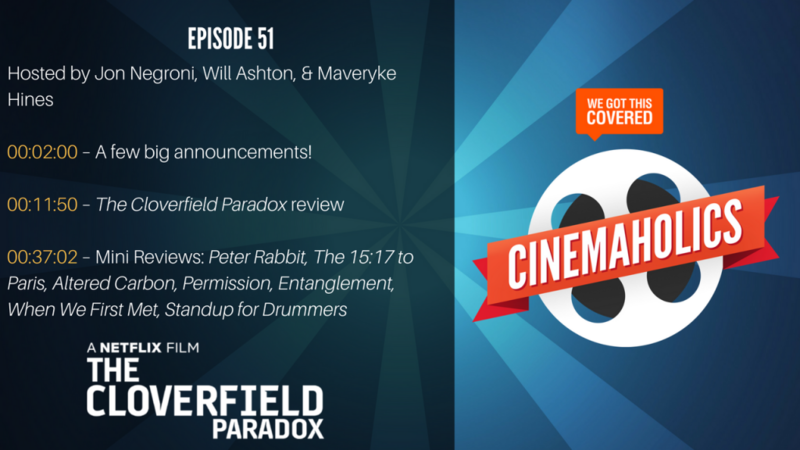 On the pod this week, we review The Cloverfield Paradox, Peter Rabbit, The 15:17 to Paris, and quite a few more flicks and shows you can see above. We also had a few big announcements for the show, which is partly why we had special guest Sam Noland join us for the full episode. First up, Cinemaholics is now on Spotify, so if that’s your streaming platform of choice, you can find our full archive right here. Second, we are now on Patreon, which means you can support this podcast and get access to a bunch of new perks we’re rolling out, including some hilarious bonus audio from this week’s show. It’s an uncensored conversation between me and Will Ashton as we waited for Sam to get ready for the episode, as we normally talk about random tangents, ideas for the podcast, and other inside baseball topics. Third, we’re launching a spinoff podcast for Cinemaholics hosted by our very own Sam Noland! The first episode of his new show, Anyway, That’s All I Got, is coming soon to a Cinemaholics feed near you. I’m 100% down for this spinoff. I enjoyed Cloverfield Paradox even though its objectively pretty bad. The first Cloverfield is the best Cloverfield. Fight me.